Hey everyone, it’s Medicine Mondays again today. Today is just going to be a short post: “Use a Helmet“. Be like Kylie. Use a Helmet. My daughter has been trying to learn how to ride her bike again. It’s been a little difficult for her since we don’t really have a big flat cul-de-sac or a quiet street for her to practice on. 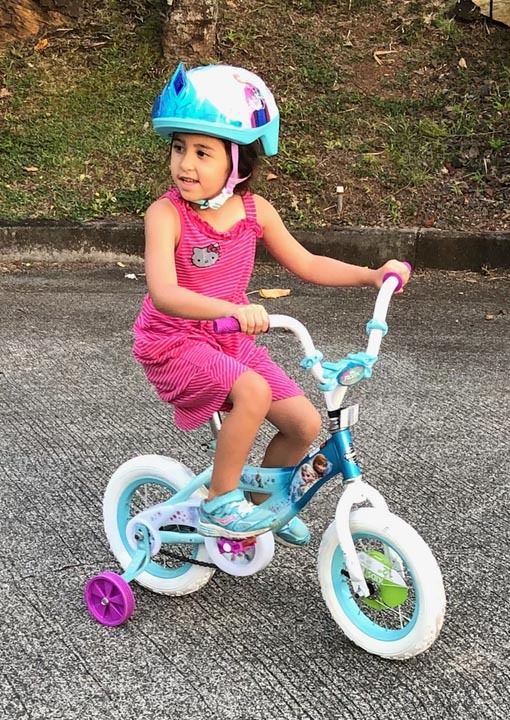 For this reason, the bike we bought for her almost two years ago hasn’t gotten much use. However, she’s interested in learning again and so we’ve been trying. This was kind of true — back then. When I was a kid I rode my bike without a helmet for pretty much all of my youth until they passed the helmet law sometime in the early 1990s. Then you could be ticketed/fined for not wearing a helmet and were under the age of 18. As a child I remember riding my bike home from elementary school from school. I think I was in 3rd or 4th grade at the time, riding my bike home with the “big kids”, my sister’s friends. I don’t know exactly what happened, but apparently there was an accident where we ran into each other. From my knowledge, we weren’t even going very fast. You may be wondering why my experience of what happened is so vague — well, it’s because I don’t remember. At the time I was told we ran into each other and my head hit the ground. I just cried and cried until the ambulance came to get me and I got checked out. Apparently I suffered a mild concussion and pretty much blacked out. I have no recollection of the accident, the ambulance, the hospital, and even the few days after. The only remember starting to ride from home school is being back in school a few days later with everyone asking me what happened. Everything in between doesn’t exist to me. The point I am trying to make is that it doesn’t take much for someone to have a concussion, especially without a helmet. Your brain is stored in this bone cage and it’s fragile. It’s not designed to be able to withstand impact. This is especially true for any impact occurring at a speed faster than humanly possible. I think this video illustrates the idea well. It may have been “ok for us” back when we were growing up, but I think we know much better now. If you’re going to ride a bike, skateboard, scooter, or roller blades, you should wear a helmet. I don’t agree with the “less than 18 years old” laws. Your brain doesn’t suddenly become less fragile once you turn 18 years old. Everyone should use a helmet. Be safe. Use a helmet. Do kids even need them when they’re just learning with training wheels? I would argue that yes they do. Kids can still fall even with training wheels. However, the more important thing is that the understand the process. I think it’s a good habit to develop. I had a concussion as a kid. Your brain doesn’t suddenly become less fragile once you turn 18 years old. Everyone should use a helmet.